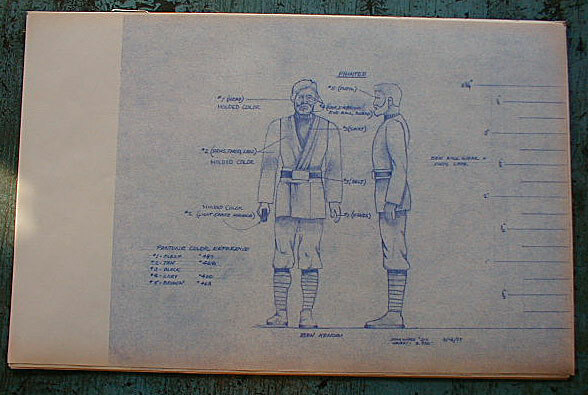 Here you see the Ben Kenobi blueprint. As you can see, it's not incredibly precise in terms of proportions and details. 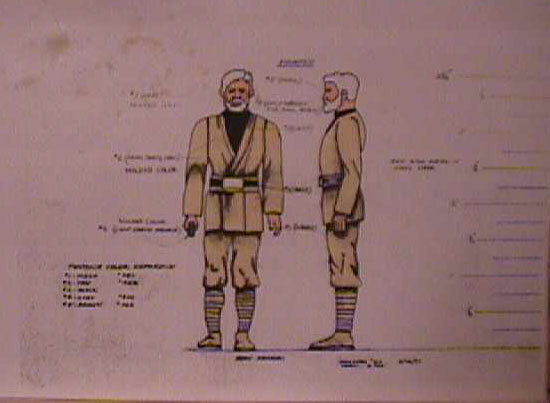 This is likely because these blueprints weren't used to set exact sculpting/prototyping specifications as were some other blueprints; rather, they probably allowed the designer to work out his ideas on paper and present his concepts to other members of the Kenner staff. 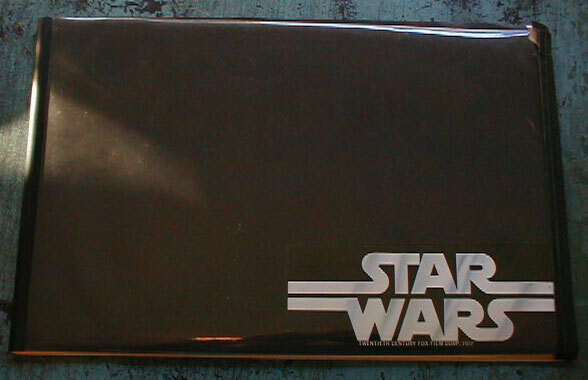 The image sort of vacillates between representing the character as seen in the movie and taking into account the features necessary on any mass produced toy. Thus, while Ben seems to have realistic rather than molded plastic "robes," thin lines have been carefully rendered around the shoulders and crotch area in order to indicate the nature and location of the figure's joints. Here's a closeup. 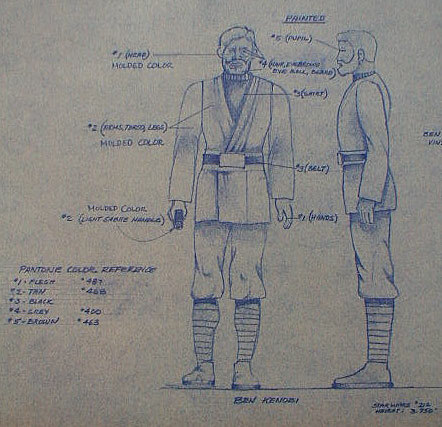 The text you see at certain points on the paper refers to the colors that were to be used when painting or molding various parts of the figure (the saber hilt, the limbs, the head, etc.). In the lower left hand corner is a small chart which specifies the exact color of each component. It refers to the pantone system, a standardized color palette used in the design profession. Apparently, the color notations weren't totally sufficient, and some photocopies were made of each blueprint, which were colored in the appropriate manner using markers. Once colored, the figure representations would be better able to approximate the final look of the toys at in house design meetings and the like. Here's a detail shot of the colored photocopy. 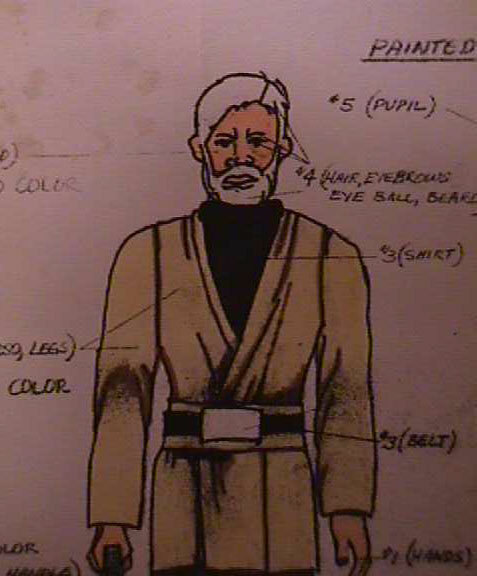 Interestingly, Ben's garments are substantially lighter here than the reddish color they were eventually molded in. I suppose it's possible that, early on, the figure was intended to represent the character without his darker outer cloak, much as he is seen aboard the Falcon while instructing Luke to duel with a light saber.